Styled as though written in a fit of rage and produced with actual typewritten typography and letterpress printing for a authentic vintage look and feel. Faux ball point pen handwritten marginalia from Cranky was added. A transcript of the writing follows the images below. I write you today concerning a worrisome development. What I refer to is the worldwide spread and infestation of this new so-called internet “culture.” It is influencing our youth, minds and promotional messages in ways I find very frightening. There was a time not long ago when a design studio’s computer capabilities were dedicated to proper professional activities such as typography, mechanical artwork preparation and the occasional hastily crafted co-worker’s divorce card. Nowadays all the pixelated hogwash can make an agency’s entire output look like one big Atari game from start through finished production. It’s time to call timeout! I’m not going to sit here lamenting the industry’s loss of essential X-Acto knife skills or reminisce about the days when a good 1/4” deep slice in the left thumb was a rite of passage in a young art director’s career. My real concern is the missed opportunities brought about by the disappearance of graphics in design. GRAPHICS! Which in my admittedly unfashionable opinion = INK ON PAPER! A well executed poster, brochure, broadside or business card speaks volumes about the character of the person or establishment from which it originates. The recipient may even care enough about this printed ‘piece of paper’ to tuck it inside a book, give it to a friend or even tack it up on a wall. Good luck trying to tack up your internet, kid. Please don’t get me wrong, I assure you I’m not some obsessive luddite fixated on past techniques such as mathematical correct copy fitting and properly annotated proofreader’s marks. No, I am totally up with these modern times (#LOLZ). It is the desire to help you make the strongest, most lasting impression with your clientele’s projects that compels me to reach out. Print is personal and one-to-one. This is not so true online where your message can easily become hijacked by an army of demonic animated felines, classless come-ons from skimpily clad young singles in my area, and other tantalizing banal tactics. I ask you why must we weave this web of deceit? Why should I be subjected to Johnny Depp in pirate costume shooting across my viewing space when I only wish to check the morning dew point? Must a bell always be rung when my electronic mail arrives? The local mailman has done his job perfectly well forever without obnoxiously announcing his every delivery. And how can someone be expected to concentrate on a written piece, when a now elderly woman, whose name I don’t even recall, from a time of my life I would prefer to forget, suddenly shows up on my screen wanting to be my friend? AND PLEASE, don’t even tell me what a poke may entail. The dot-com bubble burst should have been a sign. I certainly saw it coming from my Y2K fortified basement darkroom (battery powered enlarger, 55 U.S. Gal. developer, stop bath & fixer, ISO 800 loaded and ready to capture any creep in my backyard). The internet was never meant to be trusted with ALL our most important life’s work. You can keep your www.freakingfreakshow. I’m sure it has its place in our business and imagine if you Googled ‘miserable old letterpress printer’ there would be a picture of my ugly face. All I ask is you consider my appeal. The internet environment is noisy, asinine and distracting! Together we can do better than this. A good piece of print is welcoming, thoughtful and respectful (and it doesn’t assault your senses, unless you’re talking about those stupid singing “greeting” cards). It can be enjoyed from your most worn out and comfortable armchair or even the porch swing with just the songbirds and Mrs. Shank’s pug Pickles providing appropriate background ambience. You can feel the fiber, care and craftsmanship in print work, and if lucky, even smell the fresh ink. Your clients, the great American public and the portfolio with your good name on it deserve your most urgent attention in this matter. Included in the letter was a pastiche of an old newspaper article. 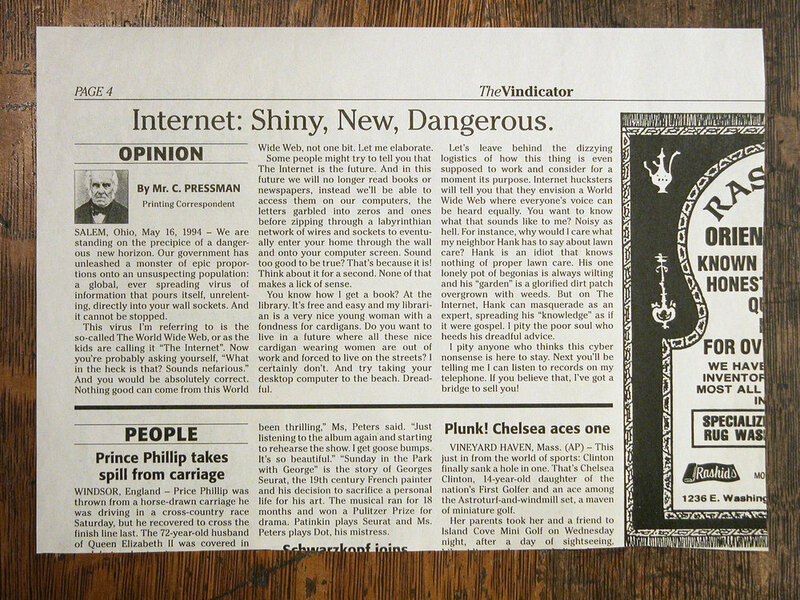 It was made to look like a clipping of an opinion column that was written by Mr. Pressman who rants about the dangers of the new internet. A transcript follows the image below. SALEM, Ohio, May 16, 1994 – We are standing on the precipice of a dangerous new horizon. Our government has unleashed a monster of epic proportions onto an unsuspecting population: a global, ever spreading virus of information that pours itself, unrelenting, directly into your wall sockets. And it cannot be stopped. This virus I’m referring to is the so-called The World Wide Web, or as the kids are calling it “The Internet”. Now you’re probably asking yourself, “What in the heck is that? Sounds nefarious.” And you would be absolutely correct. Nothing good can come from this World Wide Web, not one bit. Let me elaborate. Some people might try to tell you that The Internet is the future. And in this future we will no longer read books or newspapers, instead we’ll be able to access them on our computers, the letters garbled into zeros and ones before zipping through a labyrinthian network of wires and sockets to eventually enter your home through the wall and onto your computer screen. Sound too good to be true? That’s because it is! Think about it for a second. None of that makes a lick of sense. You know how I get a book? At the library. It’s free and easy and my librarian is a very nice young woman with a fondness for cardigans. Do you want to live in a future where all these nice cardigan wearing women are out of work and forced to live on the streets? I certainly don’t. And try taking your desktop computer to the beach. Dreadful. Let’s leave behind the dizzying logistics of how this thing is even supposed to work and consider for a moment its purpose. Internet hucksters will tell you that they envision a World Wide Web where everyone’s voice can be heard equally. You want to know what that sounds like to me? Noisy as hell. For instance, why would I care what my neighbor Hank has to say about lawn care? Hank is an idiot that knows nothing of proper lawn care. His one lonely pot of begonias is always wilting and his “garden” is a glorified dirt patch overgrown with weeds. But on The Internet, Hank can masquerade as an expert, spreading his “knowledge” as if it were gospel. I pity the poor soul who heeds his dreadful advice. I pity anyone who thinks this cyber nonsense is here to stay. Next you’ll be telling me I can listen to records on my telephone. If you believe that, I’ve got a bridge to sell you!